Book: A Fair Share - EnvironMath! 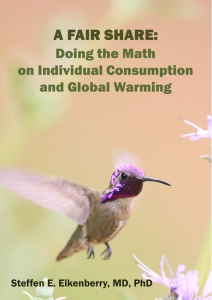 Like many members of the American consumer class, I’ve been haunted by the specter of global warming, and whether individual consumption matters at all (and if so, whether anyone can make meaningful changes). So, I wrote a book to help answer the question for myself (the short answer is yes). Check it out at amazon.com or barnesandnoble.com, available in paperback and eBook (both Kindle and Nook). Several free excerpts are available to read online or download below. See what it’s all about with this handy Table of Contents! What better place to start than the Introduction? The complete chapter (Chapter 4) on electricity generation. Short excerpt on the basics of personal transportation and petroleum fuels. Get an overview on how food, and especially the consumption of beef and other animal products, contributes to global warming with the Introduction to Food and Agriculture chapter. Learn some more about pesticides here. The complete chapter (Chapter 21) on livestock and animal agriculture. Chapter 22, which compares organic and conventional agriculture, discusses the problem of agricultural productivity, and breaks down the environmental farce that is corn ethanol. Find out just what all those reference numbers in the other excerpts are referring to with the Bibliography. Stay tuned for more fun and informative exerts!